My assignment from Get It Scrapped! : Make a page that uses ONLY cool colors. 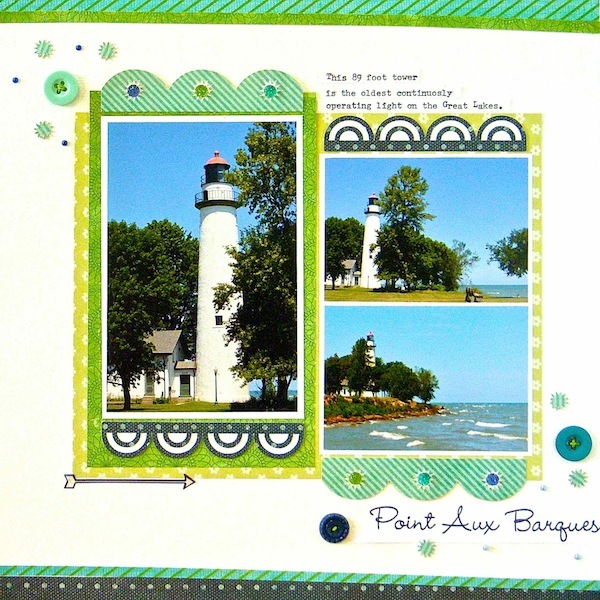 This page is about our visit to the Pointe Aux Barques Lighthouse on Lake Huron. Taking my cue from the sky, trees and water in the photos, I chose a variety of blues and greens to capture the calm, restful mood of the scene. The lighter color palette and white background keeps the layout fresh and crisp. By having patterned paper and embellishments organized by color, I was able to find and combine eight manufacturers on this layout: Basic Grey, Crate Paper, Jenni Bowlin, My Mind's Eye, Studio Calico, October Afternoon, Doodlebug and Queen & Co. The color palette is the unifying factor! You can see what the rest of the design team created in the article here. There is also a new, fantastic resource of 500+ organized scrapbooking ideas. I've got this page bookmarked! This is such a beautiful combo of both colors and patterns, Sue! Such a pretty, soothing page. That is a lot of manufacturers on one page. These colors fit perfectly. Great job balancing so many different manufacturers on one LO. Everything flws so well, I would never have guessed your secret. This is gorgeous! I always love seeing your lighthouse photos! Great page! Love the colors! beautiful layout, so balanced ! I like the scallop borders. Perfect for a water themed page. Those cool colors are perfect with the photos! Love these awesome photos Sue! And these "cool" color scheme works perfectly with the pictures! Such a gorgeous page! Cool layout! :) The colors you pulled together work so well with the photo and putting it on a white background really makes the photos pop. Blues and greens are my very favorite colors to work with so this one really speaks to me.